*Vinyl Part A* "This is a second selection of independent disco records featuring rare and classic tracks originally released in the USA between the halcyon years of 1977 and 1985. 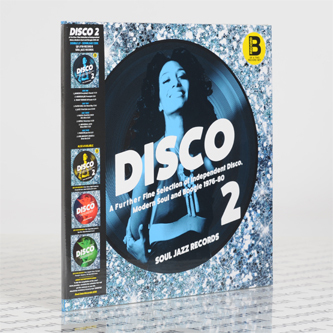 This release features only the finest disco, modern soul and boogie and is compiled by Disco Patrick who last year put together the mighty ‘Disco: An Encyclopedic Guide To The Cover Art Of Disco Records’ 400+ page deluxe book for Soul Jazz Records, as well as the first installment of ‘Disco: A Fine Selection Of Independent Disco, Modern Soul And Boogie.’ This album is released as a double CD, two separate volumes of double vinyl (plus free download codes) and a worldwide digital release. This album features rare, classic and in demand tracks from the mighty vaults of labels such as New York’s Salsoul and Miami’s TK Records - which, during the main disco era, became the main competitors to the major established record industry - through to killer virtually unknown tracks released on tiny bespoke one-off labels now impossible to find either in the history books or record shops of the world. Before its mainstream consumption in the late 1970s, disco first emerged from independent record companies run by lovers of this new sound: Patrick Adams and Peter Brown, the powerhouse musical partnership based up in Harlem, New York; Henry Stone at TK, a man with a 30-year old career distributing black music; or the Cayre brothers at Salsoul, linking Latin roots with the deep, soulful music emerging from Philadelphia and New York. In fact, as we can see on this album, Harlem was to prove a fertile ground of nascent independent disco with numerous young producers, alongside leaders of the pack Patrick Adams and Peter Brown, hustling to release oneoff or a couple of singleas on their own independent labels. All the music on this album has been sonically and digitally remastered with love and is presented complete with sleevenotes, original label artwork and full length extended disco editions."